SRK Fan Club -- Part 2! Situation Game - A member writes a situation from one of SRK's movies and the next person sings the song that matches the given situation and then posts the next! EX: SRK singing on a train! Answer: Chaiyyan chaiyyan chaiyyan chal chaiyyan chaiyyan chaiyyan chaiyyan.... (the member who posts this answer then posts the next clue/situation also)! ENJOY! Dream Date Contest - Details will be provided in the following post however, please take note that the deadline is SEPTEMBER 8, 2006! *Special thanks to Doly and Zaara for the great idea! DOTW (Discussion of the Week) - We will have weekly discussions on a specific actress (or actor even) and members will provide their opinions on whether or not that co-star suits SRK and why or why not! The best answer according to our judge(s) (to be announced) will then be presented! CURRENT Co-Star for DOTW: RANI MUKHERJI! MOW (Member of the Week) - We will begin selecting MOW's for our club based on participation and activeness in the club! We will celebrate MOW with great and fun questions and rewards! Our first MOW will be the winner of our first DOTW! PARTY - Coming soon to celebrate our MOW! Last date is August 26th! *(Sorry about the changes Doly, it didn't copy/paste correctly)! Congrats once again to all SRK'ians on winning CM! Party guys kool ideas luv it..
"Chal Chaiyya Chaiyya Chaiyya Chaiyya"
His attendants Subhash, Ravi dada, Mohan and Yasin, haven't changed in a thousand moons. Neither have his relationships. A family man and a friend in fair weather and foul, his superstardom has paradoxically made him more grounded. 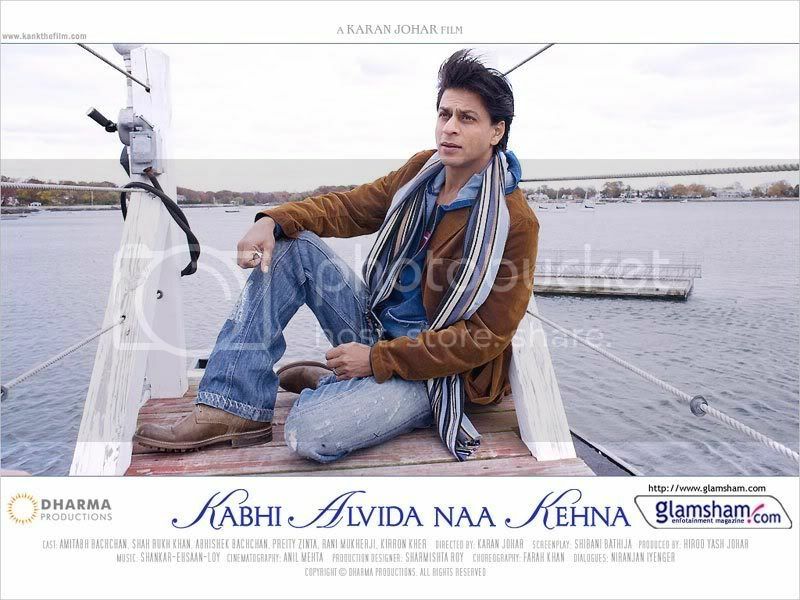 In the much-anticipated Kabhi Alvida Naa Kehna, he portrays a man carroming between love and fidelity. Which is why I want to know..
What's your take on relationships? Relationships are mini-lives. What we don't expect is their impermanence..we don't remember that relationships, like our lives, are not for keeps. Are you scared of mortality? No, I'm not scared of dying. If I will miss my children here, I'll meet my parents up there. But that's not likely to happen soon..it's said only the good die young, so I'm going to be around for at least 120 years. Doesn't your fluctuating health, because of your back problems, slow you down? Never, there's a certain oneness with my back, it never lets me down. My head and my heart know that nothing can stop me from having a great life, personal and professional. It's like accepting the fact that I need spectacles to read. The No. 1 Ladies' Detective Agency, Hello magazine. With the role of a mean, cynical husband in KANK, aren't you killing off your persona of the lover boy? Yeah, as Raj and Rahul I ran after girls, grew a beard, spent all the time in the world with them and... in Mohabbatein I even loved a woman after her death. I've been a ghost who makes love (Paheli), I've remained celibate for 25 years in jail for a woman (Veer-Zaara). I've been the ultimate lover to the extent that women in the audience have felt, "Why can't our husbands be like Shah Rukh Khan?" In KANK, I'm not like that at all but I'm not mean enough either. In reality, I could perhaps leave my wives... plural because I'm a Muslim!... but I could never leave my children. That would kill me. In my performance, I've held myself back, like I can never use bad language or become physically abusive. I've been less stylised though I've used a grimacing of the mouth and chewed gum... these are an actor's props, his crutches. Otherwise, I've played it real. (Laughs) Come to think of it, I've made a career out of snatching other men's women whether it's in Koyla, Kuch Kuch Hota Hai and Yes Boss. Immodestly, I can also say I've given birth to all the heroes who are playing negative guys. Having seen me every which way, the audience just expects to see me in an engrossing, entertaining film. I have no qualms about doing any role. It would be great to do a Brokeback Mountain produced by Anil Kapoor. Is infidelity a big deal in this day and age? It isn't. When so many people around me say that they are in love outside marriage, I can understand that. But I wouldn't claim that I would do the same for the reasons they give me. It's all about different strokes for different folks. What does love mean? How many people are you in love with? With 22, simply because that sounds like a good number. There are different kinds of love, different manifestations. When I hug any of these 22, I feel excited, happy, turned-on or crushed..Geoid is the word for the shape of the earth. Similarly the word love describes love. You can fall in love with the right or the wrong person..which goes to show that love may not be blind but it's short-sighted for sure. When you fear losing someone that's love. So whenever any of the 22 people I love are travelling by air, I say a prayer for them. Okay, has the nature of relationships changed today? We are more permissive. We have lost out on the thrill of the first touch. Young boys and girls kiss too easily now..if love comes easy it doesn't have enough value. In school I kept away from girls, I was into sports and stuff and found them too prissy. I fell in love with Gauri when I was 18. In fact, I'm still old-worldly in my belief that you must first fall in love and then get physical. Nowadays though, couples find themselves sexually compatible and then believe they must be in love. I just hope it'll be the reversal of the process for my children in this fast-moving world. To be in love is to feel as if you're flying in air... without the use of drugs or alchohol. That sounds like a worried father speaking. Maybe. Everyone needs a high and I get it from knowing that I'm the sexiest actor alive without the use of any substances. janavii	 9 617 2018-04-18T06:20:21Z .purplerain. iambest	 21 889 2017-07-14T04:48:18Z .Intoxicated.